1. Supporting numerous standard protocols and services, including SMTP, SSL-SMTP, POP3, SSL-POP3, IMAP4, SSL-IMAP4, WEBMAIL, CA Server, TLS-SSL, S-MIME, DayTime, and other relative RFC protocols. 2. Advanced virus protection, with support for popular Anti-Virus engines. 3. TLS-SSL Secure Sockets Layer (1024-bit RSA encryption) security with full support for SSL SMTP, SSL POP3, SSL IMAP4, allowing secure transport of mail messages and efficient protection from Sniffer. 4. Powerful three-tier infrastructure for personal and group address book management, including personal contact lists, domain public contact lists and public (system) contact lists, and complete administration features as well as import, export mechanism. 5. Supporting digital certificates authentication, with powerful features that allow the users to compose or read digitally signed or encryped secure mails(S-MIME), military level security (4096-bit DH-DSS encryption or 2048-bit RSA encryption. 6. Unique question-answer utility, along with reliable multi-layer spam protection infrastructure and intelligent spam filtering features simulating the manual-processing service available only in large post offices, which keep junk mail away from the inbox. 7. 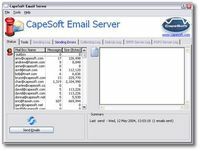 Powerful user-level virtual mailbox function, which enables users to specify any private folder to be their virtual mailbox, and customize auto-forward and auto-response for each virtual mailbox. 8. Powerful Network-Storage function, allowing folder management, and memo-attaching for each file stored. 9. Full-featured folder sharing, including, sharing of private folder and storage folder. 10. Powerful BBS (public folder) function, capable of holding up to 9999 different BBS. 11. Supporting IMAP4 service, allowing users to manipulate messages on the remote server. 12. 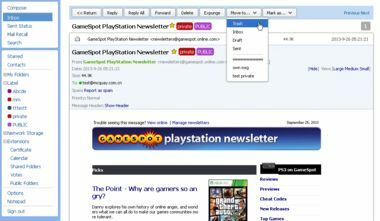 Customizable mailbox color schemes. 13. Carefully designed electronic voting function. 14. Excellent web support. 15. Provides complete calendar and schedule service, making it easier for you to coordinate with other group members.